Science fiction writer Liu Cixin attends his Three-Body Trilogy book sale and signing event in Shanghai, August 21, 2016. This article was first published in the June 7, 2018 issue of The New York Review of Books. In 1902, Liang Qichao, a reformist intellectual of the late Qing dynasty, wrote a futuristic story called “A Chronicle of the Future of New China.” In the unfinished manuscript, he depicts Shanghai hosting the World Fair in 1962 (“Confucius year 2513”), on the fiftieth anniversary of a successful reform movement. By then, he imagines, China has developed a multiparty system and dominates a peaceful new world order in which Westerners study Chinese to improve their job prospects. This vision of a modern, technologically triumphant China would prove prescient—except for the multiparty system and peaceful world order—in 2010, when the Shanghai World Expo impressed visitors with its slick graphics, high-tech gadgets, and other emblems of modernization. Liang’s optimism for China’s rejuvenation was vindicated, only fifty years later than he thought. Liang’s intention was not to predict the future, however, but to change the present. The message, if it reached those in power, fell on deaf ears, and the Qing court continued to reject Western science and democracy. With his mentor, the liberal Confucian scholar Kang Youwei, and under the auspices of the young Guangxu emperor, Liang had spearheaded the Hundred Days’ Reform of 1898, which ended with a coup d’état by the sixty-three-year-old empress dowager Cixi, who stymied further attempts at reform until her death in 1908. Liang and Kang fled to Japan, which was rapidly modernizing during the Meiji Restoration and importing ideas and literature from overseas. It was here that Liang came across the science fiction of Jules Verne, in Japanese by way of English from the original French, and translated it into classical Chinese, starting with the anti-slavery novel A Captain at Fifteen. Liberal intellectuals from China in that era often studied in Japan, as if China could modernize by osmosis. In 1901 Kang Youwei published his own speculative work, The Book of Great Unity, delineating a future in which states, rulers, and conflict have been eliminated (women, less lucky, replenish the population by giving birth while calming music is played for them). Another young writer studying in Japan was Zhou Shuren, or Lu Xun, sometimes described as the father of modern vernacular Chinese literature, who translated other Jules Verne novels, including Journey to the Center of the Earth. The typical reader is bored by the tediousness of science books and cannot finish them. But when dressed up in the form of fiction, the science can seep into readers’ minds without boring them…. As the reader’s heart is touched, the reader gains insight and wisdom without taxing the mind, knowledge that would break down legacy superstitions, improve their thoughts, and supplement our culture. What a powerful tool is such fiction! The genre bloomed in the late 1970s and early 1980s under Deng Xiaoping’s early reforms, with experimental works such as Little Smart Roaming the Future by Ye Yonglie, before it again fell out of favor as a foreign-influenced indulgence in the Campaign Against Spiritual Pollution of 1982. It then suffered from the same suppression of free expression that affected all literature in China following the killings near Tiananmen Square in 1989. China today meets many of the measures of progress its earlier science fiction writers imagined. The nation is stronger and richer than it has been since the Ming dynasty. Its populace is literate and largely educated. It is at peace and has the military might to defend itself. Above all, after decades of sclerosis and decades more of chaos, it now has the infrastructure and scientific capability of many developed countries. But a new renaissance of Chinese science fiction, which began in the 1990s and found its stride in the mid-2000s, is asking whether that development is benign and equitable and what social problems it has created. If the science fiction of a century ago was preoccupied with utopian dreams of progress, this new wave, made up mostly of younger writers, is more concerned with the rifts that have been opened in China’s social fabric now that such progress has been achieved. The question then was how China could become rich and strong; the question today is what to do now that it is. Earlier generations of Chinese sci-fi authors had been raised on Soviet works. This one is influenced instead by such Western authors as Arthur C. Clarke and Isaac Asimov, and by the work of the “New Wave” in the 1960s and 1970s—with authors such as Ursula K. Le Guin and J.G. Ballard—which pioneered “soft” sci-fi, known for its social themes as opposed to technically oriented “hard” sci-fi. The new sci-fi is now in many respects the most biting mode of social and political commentary in China. Long derided and marginalized by China’s literary establishment, it has slipped past the censors who so stringently watch realist fiction. And while much of the genre remains escapist entertainment for the nation’s surplus of engineering students, its more literary practitioners have reclaimed its place at the vanguard of China’s national introspection. They are using it as a Trojan horse to sneak in truths obliquely, offering not feel-good bromides but twisted visions of what modern China has become. Liu Cixin and Wang Jiankang are two of the “three generals” of Chinese science fiction, along with Han Song, whose day job is covering politics for the state-owned news service Xinhua. All three have been writing since the 1980s. (Sometimes a fourth, He Xi, is added, to make it the “four big names.”) The genre received wider recognition in China and abroad with the critical and commercial success in the mid-2000s of Liu Cixin’s trilogy, Remembrance of Earth’s Past, commonly known as the Three-Body Trilogy. Some four million copies have been sold, a long-delayed film is set to follow next year, and in Beijing a group of sci-fi writers and I saw a theatrical adaptation, with floating orbs and futuristic special effects. 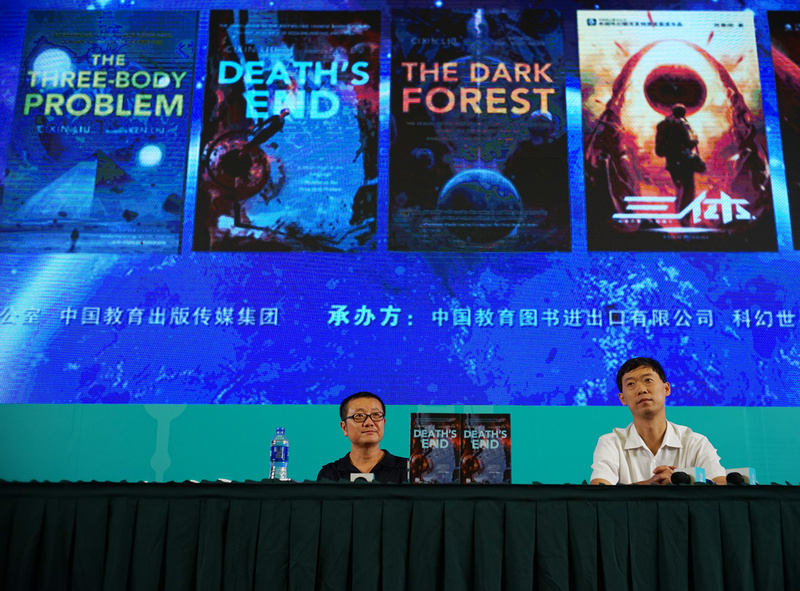 The books were translated into English starting in 2014, and the first volume (The Three-Body Problem) won a 2015 Hugo Award for best science fiction novel. While the plot of the Three-Body Trilogy sounds like that of a B-movie—Earth prepares for invasion by aliens fleeing a doomed planet that orbits three suns—it begins not in the future but in the past. During the Cultural Revolution, the astrophysicist Ye Wenjie witnesses her father being beaten to death by Red Guards. She later broadcasts Earth’s location to the hostile Trisolarans when their signal first comes through, declaring humanity a failure in need of outside intervention. Liu Cixin, who spent most of his career as an engineer at a power plant, is ultimately more interested in exploring humanity’s place in the universe than he is in reckoning with China’s historical ghosts. Yet this indictment of a time he is old enough to remember would surely not have made it into a work of realist fiction published in China. Published in the aftermath of Liu Cixin’s success, Invisible Planets is compiled and translated by Ken Liu, the translator of two volumes of the Three-Body Trilogy. The collection features two stories by Liu Cixin—one adapted from the novels, and another in which he satirizes China’s culture of filial piety by inventing a decrepit God species that requires the support of humans in its old age. Ken Liu is himself a prolific sci-fi author, currently completing a trilogy of what he calls “silkpunk” novels set in ancient China. In his introduction to the anthology, he warns us not to interpret Chinese sci-fi too literally, lest we “see it through the lens of Western dreams and hopes and fairy tales about Chinese politics.” Many of the stories pose questions about the place of technology and artificial intelligence in modern life, or about the divisions within societies around the world. Yet like their ancestors of a century ago, others are also clear and critical commentaries on the environments that produced them. One such story to receive widespread attention, and a Hugo Award in 2016, is “Folding Beijing” by Hao Jingfang. Hao, who is in her early thirties, studied physics and economics at Tsinghua University, and now works at a macroeconomics think tank. In her imagined projection of Beijing, three iterations of the capital, occupied by three separate social strata, have been engineered to fold in on themselves like a Rubik’s Cube so that the next “space” can unfurl for its apportioned time above the earth’s surface. “First Space” is constructed for five million elites, who live in a leafy urban playground for every other twenty-four-hour period from 6 AM to 6 AM; “Second Space” houses the 25 million members of the literally squeezed middle class, who occupy it for the following eighteen hours; and the squalor of “Third Space,” rising between 10 PM and 6 AM, is for the remaining 50 million migrant workers who process waste and perform other services for the privileged inhabitants of the city they built. The story follows Lao Dao, a Third Spacer who smuggles himself into the opulence of First Space to deliver a message. Its social themes were not lost on its readers, whose discussions online in bulletin board (tieba) forums and social media threads were later deleted. Shortly to be turned into a movie, “Folding Beijing” became eerily relevant at the end of 2017, when the Beijing government evicted thousands of migrant workers from the outskirts of the capital in order to keep their numbers within quota, under the guise of fire safety. In another case of life imitating art, Hao Jingfang told me that she wrote the story to scrutinize what she called “big city disease,” a term that has now been used by China’s State Council to justify its program of limiting the migrant population in large cities. “Invisible Planets,” also by Hao Jingfang and the story that lends its name to the anthology, is a galactic homage to Italo Calvino. Her narrator tells tall tales of far-flung planets to a captive listener. There is Pimaceh, torn by conflicting and untrustworthy versions of its history; Yanyanni, where the population grows taller every year until the old physically can’t bend low enough to communicate with the young (the generation gap is a recurring motif for Hao); Lutikawulu, where genetics restrict families to evolutionarily optimized roles, making social mobility impossible; and Chincato, where the air is so dense that no light can penetrate it and inhabitants live in darkness, constantly chattering to tell each other where they are. The real key isn’t about whether what I say is true, but whether you believe it. From start to end, the direction of narrative is not guided by the tongue, but by the ear…. The planets I speak of are scattered at every corner of the universe, but sometimes collect themselves into the same place as though they have always been together. Just as Calvino’s fantastical cities were all different refractions of Venice, Hao’s planets are entirely distinct from, and nothing but, her homeland. In his book Celestial Empire (2017), the scholar Nathaniel Isaacson called Chinese science fiction “a vehicle for expressing anxieties and hopes for modernization and globalization.” China’s urban transformation and vertiginous growth have bifurcated society: some live in a rich, privileged world of comfort, cashless payment, facial-recognition software, and high-speed trains; others suffer quietly, building that world. Realist literature often can’t keep up with the pace of the change that China is undergoing. Fictions set in the future are not only safer from censorship but also especially good opportunities to comment on such a hurtling present. It is no surprise that covert or coded modes of communication recur within a genre that might itself qualify as such. “Ether,” by Zhang Ran, is the first story in the bilingual collection Touchable Unreality, a Chinese coproduction with Clarkesworld magazine that is currently only published in China (its title in Chinese, which translates to Mirror Image of the Future, is more literal and less pretentious). In Zhang’s story, dissidents rebel against a police state by tracing Chinese characters onto one another’s palms, eventually leading to a peaceful demonstration on a central city square where protesters stand in a circle and hold hands to communicate silently. In her novel Death Fugue, which also has sci-fi elements, the young writer Sheng Keyi refers more directly to 1989 with a fictional protest in which the famous Goddess of Democracy statue is a tower of excrement. The protesters are imprisoned in both cases. In “City of Silence” words are added to the blacklist until all language is forbidden. The new wave of sci-fi is not all bleak—many stories offer optimistic visions of technological solutions to China’s problems. And China’s censors seem more keen to co-opt sci-fi than to repress it. This was made clear in November at the eighth Chinese Nebula Awards, ainitialed, televised event that mimics its longer-running Western equivalent. In his opening speech, written in collaboration with the organizers, the writer Chen Qiufan talked about the imperative of Chinese science fiction to “grasp what General Secretary Xi [Jinping] has put forward, and advance the establishment of the power of the international spread of the culture of socialism with Chinese characteristics, in order to tell the China story.” (The apparatchik syntax is as origami-like in the original.) Various officials and academics proceeded to show off China’s technological prowess, with such questionable delights as an artificial intelligence program that can tell how beautiful you are. Chen Qiufan’s own science fiction, which appears in both anthologies, concentrates on technology (he used to work for Google in China, and is now at a virtual reality firm) but displays the same iconoclastic social commentary characteristic of his generation. In “Coming of the Light,” a start-up company seeks a Buddhist master to bless its app, while a gullible clientele claims magical effects. “The Year of the Rat” solves youth unemployment and militarism by putting graduates to work hunting mutant rats. “Smog Society” explores the connection between air pollution and depression, while “The Mao Ghost” uses the word for “cat,” a homonym of Chairman Mao’s surname, to sneak in forbidden references to the death toll of the Cultural Revolution and the Great Leap Forward. In his novel The Waste Tide, not yet published in English, Chen pits capitalism against its victims on an island dedicated to the processing of electronic waste that is modeled on the real e-waste town of Guiyu in southern China. “This is a future,” as Han Song described the book, “that will make a young person feel the death of idealism.” Han Song himself—winner of the 2017 Chinese Nebula Award—is no less grim. His story “Security Check” in Touchable Unreality parodies China’s ubiquitous subway security scans, a symbol of the nanny state, which he imagines intensifying ad absurdum; while in “Finished,” an unfeeling boss traps a worker in a Kafkaesque argument about why he cannot get paid for his labor. some are pessimistic, believing that we’re powerless against irresistible trends; some are hopeful that human ingenuity will ultimately triumph; still others resort to ironic observation of the absurdities of life. In the 1910 story “New China” by Lu Shi’e, the narrator awakens in 1950 to find China strong, rich, and kind to its people (“practically socialism already, and so of course we’re not plagued by Communists”). As the nation reckons with the human price of its accelerated modernization, today’s science fiction is more divided about China’s prospects for 2050, the date by which Xi Jinping wants it to become a “great modern socialist country.” At the very least, this new generation of Chinese sci-fi authors questions whether development alone, without a humane society and consideration for those whose rights have been trampled over in the name of that advance, is enough for the future of the new China.